US 23 begins in Mackinaw City, Michigan and follows the shore of Lake Huron to Bay City, then heads south to Ann Arbor, and into Ohio just west of Toledo. While heading south through central Ohio, US 23 passes through Columbus and then continues south to the Ohio River where it crosses into eastern Kentucky. 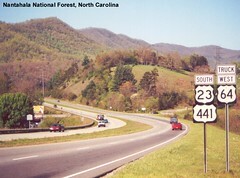 US 23 continues south through western Virginia, eastern Tennessee where it passes through Kingsport, and western North Carolina where it reaches Asheville. After leaving Asheville, US 23 heads southwest to Georgia where it passes through Gainesville and then Atlanta. US 23 leaves Atlanta and heads southeast, eventually meeting up with US 1 which it follows into Florida. US 23 ends in Jacksonville, Florida. We drove US 23 from end to end in the spring of 2001 and was the last trip we took without any children. These photographs were taken while on that trip. View individual pictures of US 23 on Flickr. Learn about how the alignment of US 23 has changed since it was originally commissioned. Information about the ends of US 23 can be found here on the www.usends.com website. Photos of US 23 in Kentucky can also be found on Froggie's Highway Photography pages. More photos of US 23 in Michigan can be found on the Millennium Highway website. A blog describing what US 23 was like in 1962, looking for sites that are still there today, can be found on Roadtrip-'62.